Lulu Software's Fixio PC Cleaner ($40, 7-day free trial) promises to keep your PC running faster and more smoothly, and to protect your privacy, by fixing registry problems, cleaning your hard drive, and deleting history files. It does what it promises. But given that the program costs $40, and CCleaner performs the same tasks for free, there may not be any reason to pay for this program. 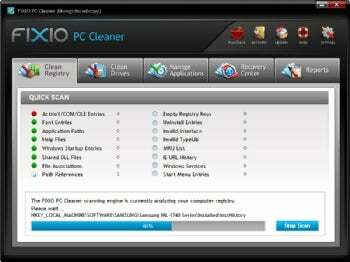 FIXIO PC Cleaner cleans your Registry and hard disk, but costs $40, while the free CCleaner does the same job for free.